Buddy Talk – a private page on Facebook began at the end of 2011 by a local parents around Little Rock, Arkansas who wanted to communicate and connect with other DS parents. It has continued to grow and extend to other states. You can “friend” either Robin Lowery Tolliver or Tricia Gault Ambeau, and we will be happy to add you. This is a great way to meet families in your area. There are monthly activities such as picnics, water parks, baseball games, museum trips, zoo trips, and much more. You may also contact them directly at cent.ark.buddytalk@gmail.com. 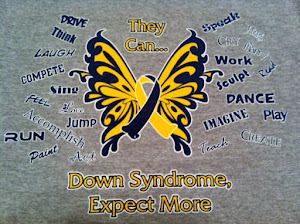 http://downsyndromeupupupandaway.blogspot.com/ - A personal favorite with good information. This was the first positive website we read after our daughters were born. Laura describes a variety of therapies and unique interventions she has done with her 4 year old daughter “K” with DS. At age 4, her daughter read at a 1st grade level and does all the activities of a typical child. http://dsdaytoday.blogspot.com/ - An overwhelming amount of information in one location. Andi describes numerous therapies she is using to assist her young son Jett. Andi includes a lot of alternative therapies, but she also has an enormous amount of research and relevant information for anything conerning Down Syndrome. A bit intimidating initially, but she will quickly become a favorite "go to" resource. http://www.youtube.com/user/BethanysBiggestFan?feature=watch – This is a must see for all parents and relatives. It accurately describes what it is like to have a child with Down Syndrome. A wonderful video. http://yomammamamma.blogspot.com/2009/12/businesses-owned-by-people-with-down.html - a list of businesses that are owned and operated by people with Down Syndrome. http://schmlloyd.blogspot.com/2010/02/how-to-build-infant-crawling-track.html - How to build an infant crawling track to encourage your child to crawl and strengthen their muscles. http://thedownsyndromeactionplan.blogspot.com/ - Mother of a 3 year old boy. She is an Occupational therapist. http://alifeworthliving.us/ - an encouraging website for new parents. Lots of photos. http://downsyndromeoptions.org/ - several of the above bloggers put this site together to compile information in one location. Very informative.